A lot of great people are doing great work with biocontrols. 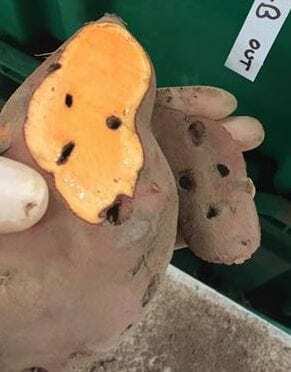 So this month I’m featuring an update from an exciting project happening in Eastern NY testing a potential biocontrol solution to wireworms in sweet potatoes. Thank you to Teresa Rusinek (Cornell Cooperative Extension Eastern NY Commercial Horticulture Program) for writing this post! I will definitely be following this project as results from 2018 come in. Check back for future updates! Professor Elson Shields and Research Specialist Tony Testa of Cornell Dept. of Entomology, have been working with NY native entomopathogenic (insect attacking) nematodes (EPNs) for the past 20 years. Initially, the EPN biocontrol systems were developed to protect alfalfa crops from the destructive snout beetle. This system has been highly successful, over 150 alfalfa fields in NY alone have been inoculated. EPNs have been proven to persist in the soil years after application. They require 2-4 years for full effectiveness determined by the application method. Cornell Cooperative Extension, Eastern NY Commercial Horticulture Educators Teresa Rusinek and Charles Bornt have been working with Shields and Testa on a multi-year research project at the HV Farm Hub to test the efficacy of NY Native EPNs in the suppression of wireworms which are increasingly damaging to various crops, especially roots crops, grown in the Hudson Valley. 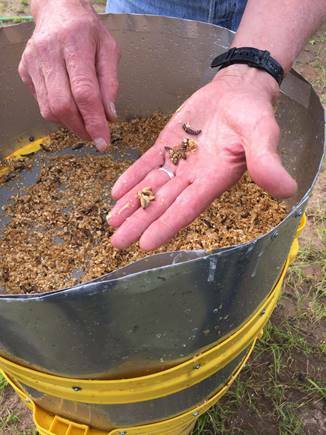 Our project began in May of 2017 at the Farm Hub, where we established research plots in a field where wireworms were found in large numbers. Four control plots had no EPNs applied, four plots were treated with both Steinernema carpocapsae (Sc) and Steinernema feltiae (Sf) nematodes, and the final four plots were treated with Sf and Heterohabditis bacteriophora (Hb) nematodes. Each EPN species occupies a different depth in the soil and has somewhat different modes of action. This research will determine which nematodes species are best adapted to establish in the field as well as which combination of nematodes is most effective at suppressing wireworms. Results from our harvest evaluation from last year look very promising. 200 sweet potatoes were harvested from each plot on Sept. 26, 2017 and scored for wireworm damage. EPN treated plots overall had 36% less wireworm damage than the untreated control plots. In addition, soil core bioassays taken earlier this spring show that the EPNs, Sf in particular, have well-established and overwintered in the treated plots. We have not yet harvested and evaluated the sweet potatoes from this growing season.